One common site from the Passing Cloud when we were in more exposed waters were birds creating and feasting on “bait balls”. In this case Rhinoceros Auklets swimming underwater were driving small fish into a tight ball near the surface. 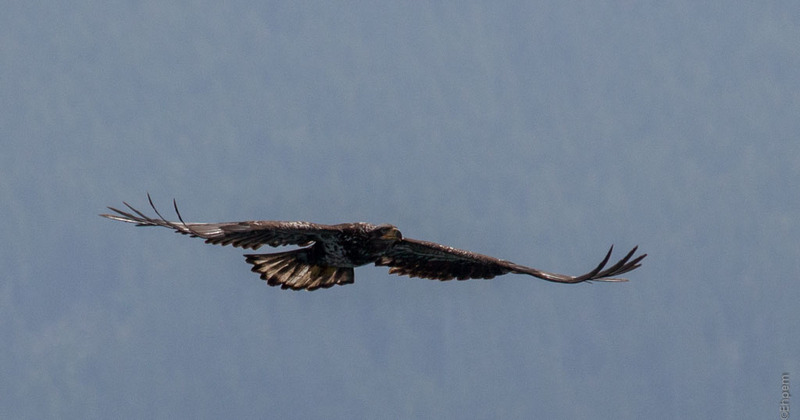 Many species of bird, and sometimes a whale, would be drawn to the ball of fish, including many bald eagles who scoop up talons full of the fish and eat them on the wing. Canon 5Dii, EF 70-300/4-5.6 IS lens, heavy crop. I am struck by what a moving experience it must be to see all of that – the R auklets, the fish, eagles feeding, whales….a privilege! Hi Lynn – it is a moving experience (diminished a bit by taking pictures, but extended also for subsequent pleasure). And I do feel privileged to go to these places and to do so often enough that they feel like a home away from home. Interesting point about the way photography can interfere with one’s direct experience, but also extends it across time. Life is full of compromises!